There are many stories about Viking Runes. What we know is this oracle was created and used by the ancient people in Scandinavia. They believed in several mystical Gods and the runes were a form of communication with them. Now, get to know more about Viking Runes. 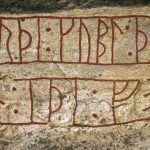 Viking Runes: what are they? The origin of ancient Scandinavian people, which includes Denmark, Sweden, Finland and Norway is full of myths and mysteries. This is not a coincidence since the word Rune means whisper, mystery, secret. Before these people had a writing as we know it today, they used to engrave symbols on the walls of the caves. These symbols, dating back to 1300 BC, referred to elements of nature, solar symbols, parts of the human body, and weapons. All such communication had profound meaning and was passed down from father to son. In all, Viking Runes had 24 symbols to compose this alphabet, which was later incorporated into the Celtic alphabet. In addition to serving for communication between humans, this set of symbols was also used as an oracle. To be used as an oracle, the Vikings could only engrave those symbols on natural materials, such as rocks, shells, seeds and pieces of wood. This was a very important part of the manufacturing process of the oracle because its meaning was intimately linked to nature. Before they started using the pieces as an oracle, they also had to consecrate it using the four elements of nature: fire, earth, air, and water. This magic oracle also served to attract prosperity and power. All the History of Scandinavia involves a strong mythology about that time. The stories about fantastic and gigantic gods with unparalleled powers are portrayed to date in movies and books. The greatest of the Nordic gods was Odin and he was the one who gave rise to the runes. There is a legend that says he was hung upside down for nine days and nine nights in a tree in Asgard, wounded by his own sword. This tree was named Yggdrasil, had colossal proportions and all the existing knowledge in that time, so much that was considered as “axis of the world”. At one point in all the suffering, when Odin was already hungry, thirsty and in great pain, he saw the runes. Before he hit the ground, he was able to catch them. The curious thing about Odin is that anthropologists say he was not originally a Viking and a god. He was a normal man with paranormal powers and lived in a tribal community in Asia. There, he communicated with the spirits and helped heal diseases and locate what was lost with the power of the mind. Later he would have emigrated to Scandinavia and created a religion based on the Viking Runes and his shamanic powers, conquering many followers. After his death, he would have been raised to God and passed on to some priests. These priests were highly respected men in the Viking community. They were identified for wearing a cloak with stones, as well as always keeping a white hood over their heads. As they held the power of the runes, the people went to them to consult the oracle of the runes. The oracle never failed and resulted in physical, spiritual, and even material matters. The habit of consulting the Viking Runes spread throughout Europe and to this day carries a magical and sacred character, which has the power to access the occult forces, always for good.